The Oconaluftee Indian Village opened in 1952 and, for over 50 years, has educated millions of visitors about Cherokee history. The site is a re-created Cherokee village set in the 1750s. Located in a wooded area on the Cherokee Indian Reservation, this attraction allows visitors to see how the Cherokee people lived, dressed, and worked over 250 years ago. All employees are members of the Eastern Band of Cherokee Indians and wear the style of clothing the Cherokees wore in the mid-1700s. Tour guides walk visitors through the mock village that includes Cherokee artisans making various crafts. The first stop on the Oconaluftee Indian Village tour is the beadwork section. Here visitors see Cherokee women working on the “solid work” method of beading, a method used by the Cherokee to make belts, headbands, and necklaces. This style of beadwork is made by sewing each individual bead to another, creating a solid piece of work that is durable and easily repaired. At each stop on the tour, a guide provides a brief synopsis of Cherokee craftwork. In the pottery section, Cherokee women make handmade pottery using native clay. A tour guide explains the traditional way the Cherokee people made their pottery from start to finish, including waterproofing by putting corncobs in the pots while they were placed around an open fire to make the pottery hard and ready to use. The entire process of making a piece of traditional Cherokee pottery takes about two weeks. Both finger weaving and basket weaving demonstrations are part of the tour. In the finger weaving section, ladies weave handmade wool yarn belts using a variety of Cherokee designs. A guide describes the process of weaving the yarn and how this method was used to make sashes, shawls, and blankets in the 1700s. Cherokee baskets are well known around the world and, at the Village, Cherokee women demonstrate their skills at basket weaving. At this stop the guide explains the traditional plant dyes used to color basket materials, the types of basket weaves the Cherokee made, and the difference in the materials and handles used when making baskets. 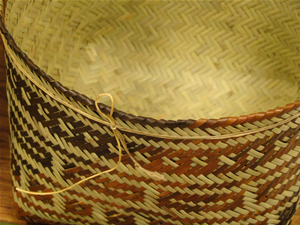 The guide also emphasizes the amount of work that goes into weaving a basket; it can take up to one month to make a Cherokee basket from start to finish. After learning about Cherokee animal traps, visitors stop at a series of recreated Cherokee homes. This section features a 1700s Cherokee home, an 1800s Cherokee home, and a Cherokee winter home also known as a sweathouse. 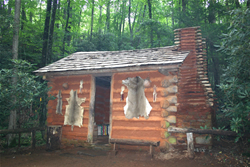 Cherokee people spent most of their time outside the home and the homes were used only for cooking and sleeping quarters. At the sweathouse a guide explains that the structure was used as a hospital by the village medicine man. After visitors learn about Cherokee homes in the 1700 and 1800s, they also see the style of home the Cherokees had before contact with outsiders. It is a common misconception that Cherokee people lived in teepees. Here this stereotype is corrected and the truth is taught about the original homes of the Cherokee tribe. The type of home the Cherokees lived in is called wattle and daub. Wattle for the walls made from woven rivercane mats and daub for the mud used to seal the mats and insulate the home. 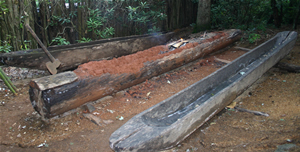 The next stop on the tour demonstrates the making of a dugout canoe. Here the guide explains how canoes were made before the introduction of metal by using the burning method. Since the Cherokees did not have metal tools to get trees for canoe making they would burn them down using red clay to control the burn. This method was also used to burn out the center of the tree for the canoe. The canoes were community owned and only used for transportation and fishing. The final craft-making stop on the tour is the woodcarving section. At this stop Cherokee men are working on a variety of woodcarvings including masks, Indian ball sticks, war clubs, etc. The guide explains the difference between the use of hard and soft woods, as well as tools, for example gardening hoes, that were made before metal was introduced to the Cherokee. Hard woods were used to make bows, war clubs, and hoes, while soft woods were used to make masks and bowls. After the woodcarving section, a tour guide explains the community storage building. Each village had a storage building that was used by every member of the village. If a person or family had an abundance of anything they would bring it to the storage building, and if anyone needed anything they could come to the storage building and get it. The storage building was also used by the village in case of emergencies, such as warfare or drought. The next stop on the tour is the ceremonial ground, also called the square ground because of the square mound of sand in the center. Here a guide explains Cherokee ceremonies including dances and instruments, the seven-clan system of the Cherokee, and the Cherokee language. The final stop on the tour through Oconaluftee Indian Village is the seven-sided council house. This part of the tour includes a lecture on Cherokee government, the role of Cherokee women, the infamous Trail of Tears, and how the Cherokee people live presently. After the tour ends visitors are encouraged to walk back through the village to ask questions and revisit craft making areas. A botanical garden walk features various native plants with explanations on how and why they were used. 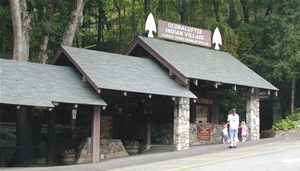 The Oconaluftee Indian Village has a gift shop where crafts made by village employees are sold. This gift shop only includes artwork and crafts made by Eastern Band of Cherokee Indians members. 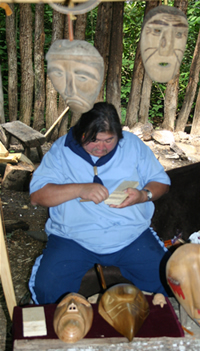 Many Cherokee artists featured on the Craft Revival website worked at the Oconaluftee Indian Village. Skills were shared among demonstrating artists. Indeed, some learned how to make their craft from other artists while working at the village. A recreated Cherokee village, the Oconaluftee Indian Village is more than just a tourist attraction and public history center, it is a way to preserve a community’s arts and crafts. For further information including hours of operation and ticket sales visit www.cherokee-nc.com or call 828-497-2111.